No matter where you live, you can't deny the allure of a traditional country home. They're cute, comfortable, and cozy, and they're even more appealing when they're shrunk down to suit people interested in tiny living! 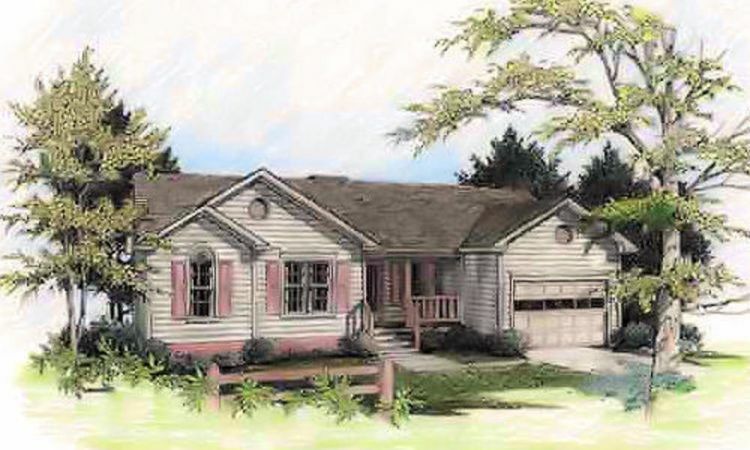 If tiny country living is your style, take a look through the plans below. They have large porches, cozy eat-in kitchens, and all the other features that make country homes so special! 1. Stylish bungalow from Architectural Designs. This home from Architectural Designs comes in at 794 square feet (74 square meters), and it boasts a lovely deck with a gazebo at the front. Inside the home, the living room and the uniquely-shaped kitchen are found on the left-hand side. The dining area is here as well. Off to the right, double doors open into the master bedroom in the back right corner of the home. This bedroom is separated from the smaller second bedroom by a bathroom with a tub. 2. 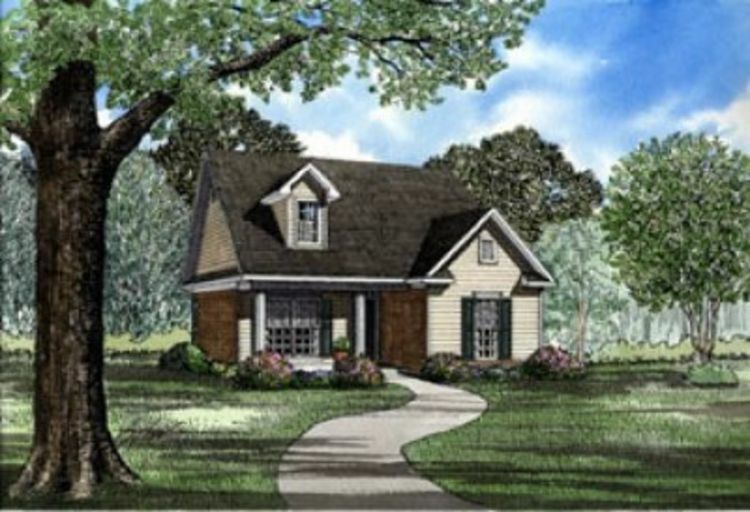 Two-story home with wide porches from Floorplans. At 923 square feet (86 square meters), this two-story design from Floorplans has plenty of visual appeal. Once inside the front door, an open concept living and dining room with a fireplace is off to the right. 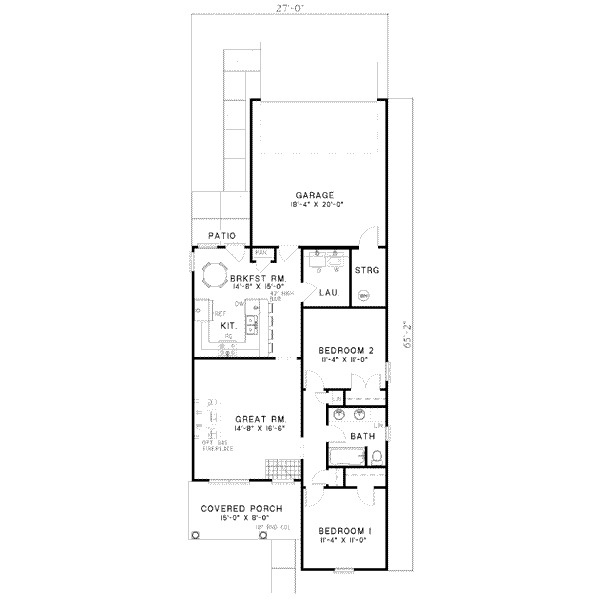 The master suite is off to the left, and it has two closets as well as a bathroom in the back corner. The bathroom can also be accessed from the kitchen, making it easy to get to every part of the house. Upstairs, the second bedroom also has two closets and is open to the main living space below. 3. 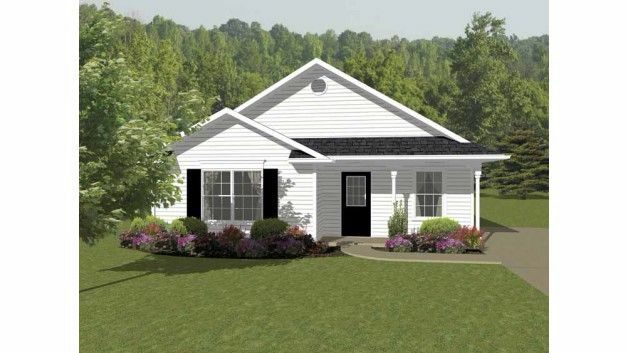 Two bedroom bungalow from Family Home Plans. 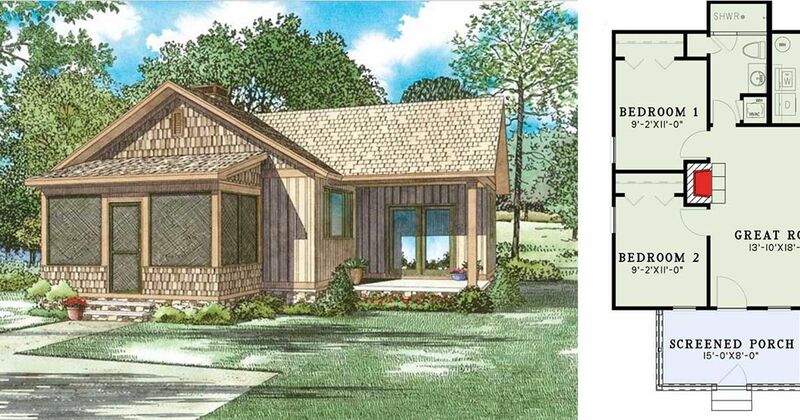 This bungalow design from Family Home Plans comes in at 911 square feet (85 square meters). There is a small entryway with a coat closet right inside the front door, and the living room is off to the left. An L-shaped eat-in kitchen is right behind the living room, and a small hallway between the kitchen and the living room leads to the private living space. Here, you will find two bedrooms and a large bathroom with both a tub and a shower. 4. 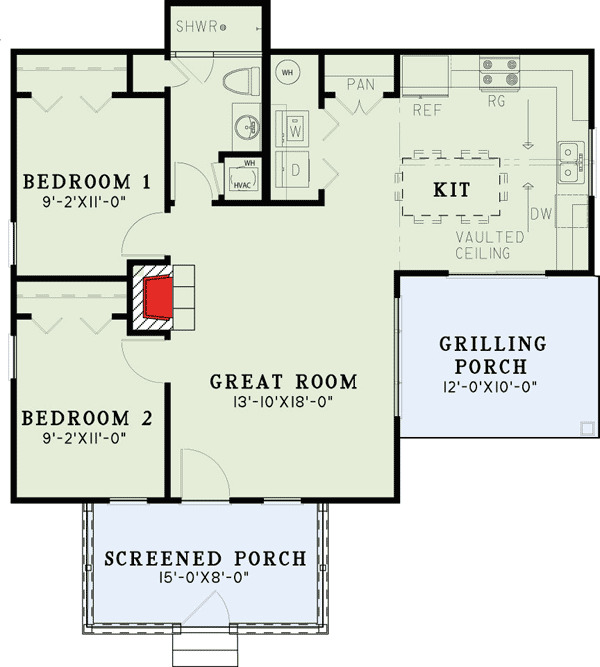 Three-bedroom rancher from Houseplans. 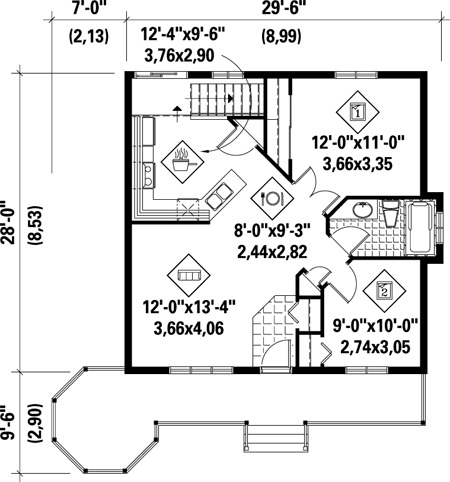 At 997 square feet (93 square meters), this design from Houseplans has plenty of room for a family. The front door opens right into the large family room, which has vaulted ceilings and a cozy fireplace. The back deck can be accessed via a door right next to the fireplace. On the right, you must walk through the dining area to access the small but efficient kitchen. It is possible to enter the garage from here, and this is where the laundry machines can be found. Three bedrooms and two bathrooms can be found off to the left; the master suite has its own bathroom and a walk-in closet. 5. 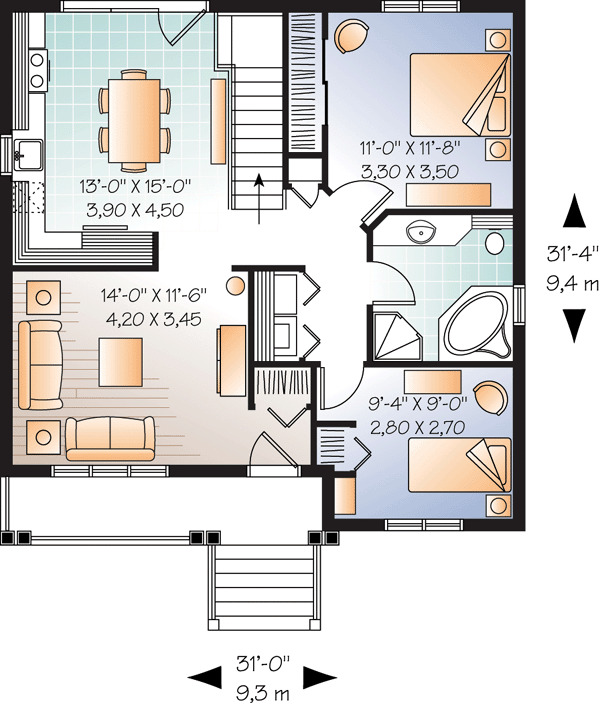 Simple two bedroom design from Floorplans. 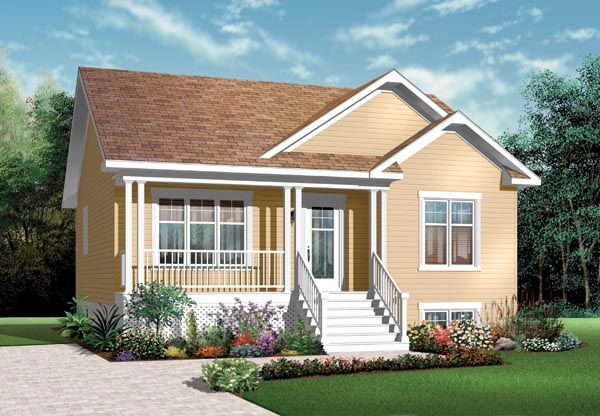 Measuring 856 square feet (80 square meters), this home from Floorplans has a porch at the front as well as one at the back. The right-hand side of the home is taken up by an open concept living room and eat-in kitchen, while the private living space is all found off to the left. 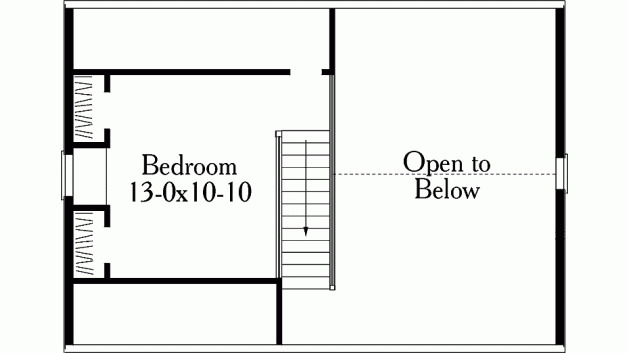 Here, a hallway leads to two bedrooms, a bathroom with a tub, and a storage closet. 6. 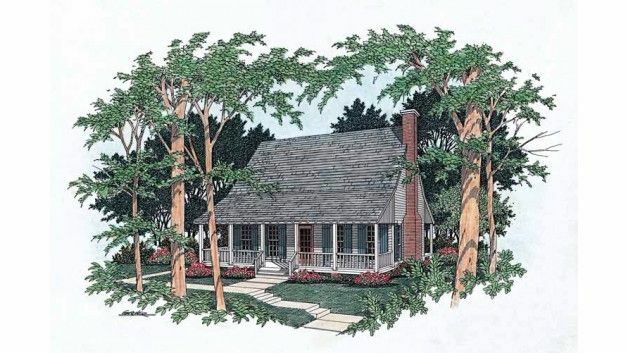 Charming cottage with screened porch from Architectural Designs. 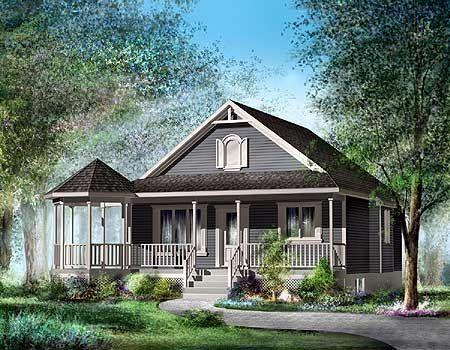 This lovely little cottage from Architectural Designs comes in at 859 square feet (80 square meters). The home is entered through a screened porch area, which leads into a great room with a fireplace. A large eat-in kitchen is tucked away around the corner; it includes a grilling porch, a laundry closet, and a large pantry. 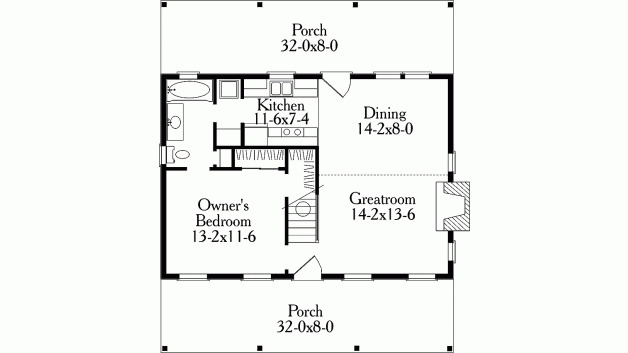 Two bedrooms are on the far left side of the home, and a bathroom with a shower is here as well. 7. 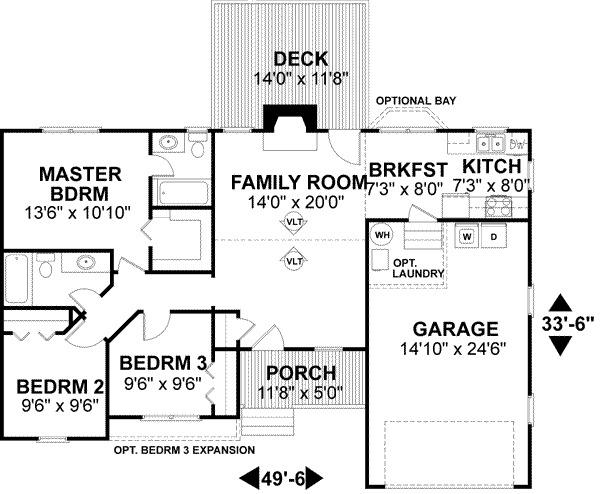 Two bedroom farmhouse from Houseplans. 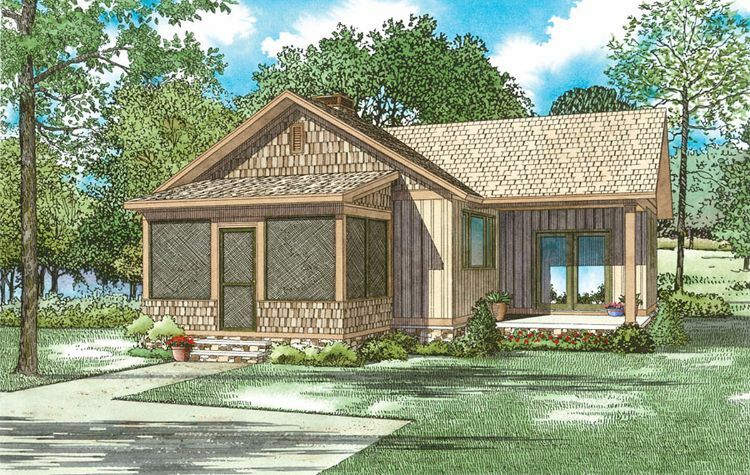 Coming in at 985 square feet (92 square meters), this design from Houseplans features a covered porch at the front and a double garage at the back. The front door of the home opens into the great room, which has an optional gas fireplace. Directly behind the great room is the kitchen, which boasts an eating bar as well as enough space to put a kitchen table. Other highlights of this room include a large pantry and a door leading out to the pantry. 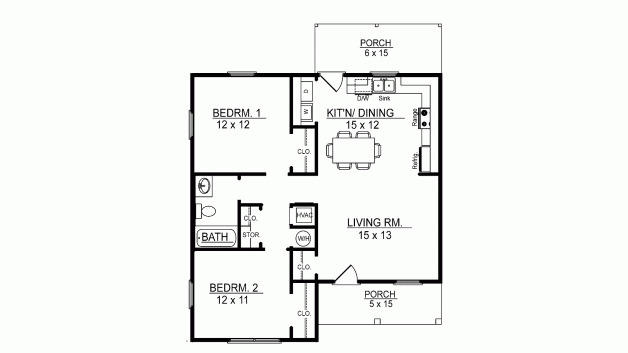 Two bedrooms, a laundry room, and a bathroom with a tub can be found on the right-hand side of the home.